Rub Kandy is an Italian artist who expresses his engaged views in multiple media. He creates regarding the immediate surroundings as a backdrop and intervening in the public space. Known also as Mimmo Rubino, this street artist and graphic designer chooses to master a creative method that takes two paths—direct and neurotic—his mixed-media approach often defines his visual identity. He is best known by his Anamorphosis street art work. Armed only with buckets of white paint and a skewed perspective, Rub Kandy creates some really interesting and visually jarring site specific work that redefines the viewer’s depth of field and creates tangible blocks out of 3D space. Anamorphosis is a quite old technique –already known in the Renaissance, it became very popular in the era of the Baroque – which today is experiencing a moment of new youth. In practice, it consists in projecting an image so that the drawn figure is visible only from one point of view (famous example: “The Ambassadors” by Hans Holbein the Younger). His other project Revolver has absolutely no reference to weapons. 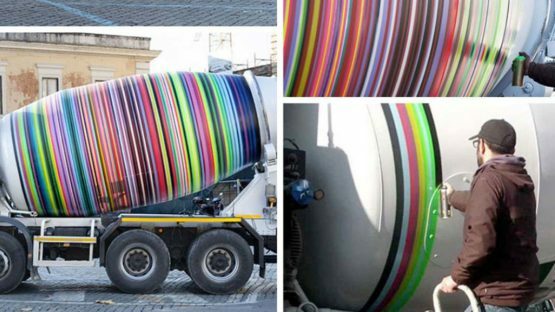 Using the surface of a rotating cement truck as his canvas, Rub Kandy stood up on a ladder to spray-paint an array of colorful rows along the cylinder. As the container spun around on its axis, the artist displayed his great eye for symmetry by producing perfectly straight lines without using any guides. So, basically, he utilized the truck’s revolving movement to create something worth staring at for hours. And for that, appropriately, the work is titled Revolver. Rub Kandy who calls himself a not-so-fine artist is melting the distinction between the street and the gallery further with a new installation in Lichtenberg, a neighborhood in Berlin. Incorporating imagery evoking Berlin’s not so distant past and its administration under Soviet authority, Rub Kandy is placing powerful memory-jolting symbols unusually in public space, and letting the associations be determined without providing context. It is hard to define Rub Kandy only as a street artist, because his works range in various fields, although the open space remains an essential element of his work. He is a prolific multi-media artist who created worldwide. Based in Rome, his work stretches to New York, and even to Panama.